A new study by Hiscox revealed that, on average, a United States-based business with at least 10 employees has a 12.5% chance of having an employment liability charge filed against them. However, California has the most frequent incidences of Employment Practices Liability charges in the country and businesses in the state have a 42% higher chance of being sued by an employee than the national average! Not surprising! Behind California, #2 is Illinois, #3 – Alabama, #4 – Arizona & Mississippi. and #5 is Georgia. 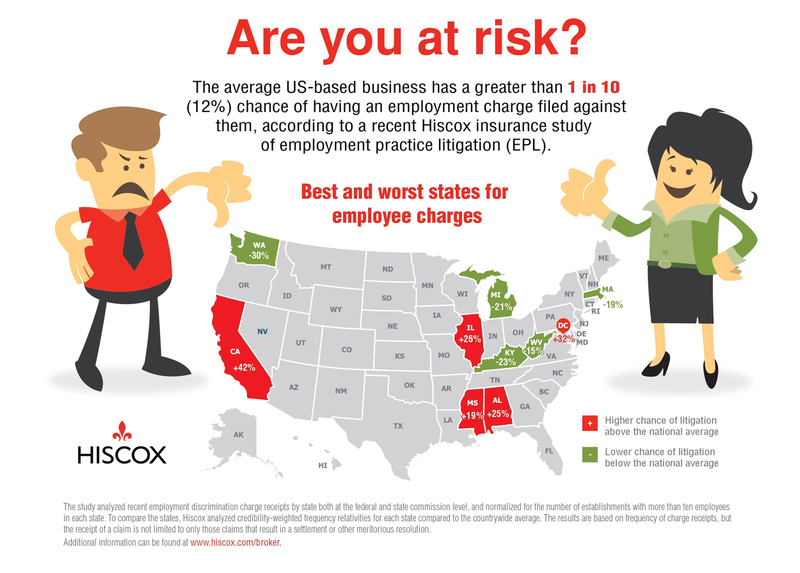 The Hiscox survey reveals that lower-risk states for Employment Practices Liability charges include Massachusetts, Michigan, Kentucky, Washington and West Virginia. One way to help mitigate loss from an employee, potential employee, or former employee suing your business for an employment related claim is to purchase an Employment Practices Liability Insurance policy. Workers Compensation Insurance does NOT cover Employment Practices Liability related claims!